This book’s unique perspective is that it looks at business from the standpoint of a Game. This leads to exploring the business excellence from the standpoint of exploring such things as the Name of the Game, the rules of the Game, the players, how to score, what makes a win, etc. The book distinguishes healthy versus toxic Games, enables you to quality controlling the Games you play, give you the power and focus to reject toxic Games and to refuse recruitment to unproductive Games. It also puts into your hands the tools for creating new empowering Games. Because that’s what we do, as inveterate Game players, we play verbal, behavioral, and mental Games In every facet of life. This is especially true for the context of Business. These Games spring from the Frames we set (our frames-of reference, frames of mind). In business, we enter into Games already underway and then learn to play such Games. Some of the Frame Games empower us to use our mental and emotional powers efficiently, other frame games undermine us, sabotage our effectiveness, and poison our state of mind. To response, we need to first recognize such games, then develop the power to refuse the toxic ones, and then step up to play the more enhancing ones. are those who excel at the Games that they play. They attain excellence because of the Game they play, how they play, then frame of mind that governs their playing, etc. Modeling their Games enables us to replicate their expertise. Expert Business Games. To get expert results, we have to replicate the way the experts think and act. How do experts play the Business Games they do? What Games do they play? 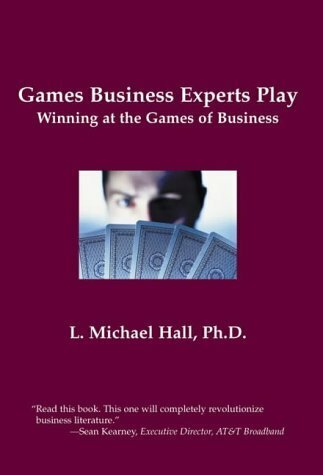 This book offers practical descriptions of how business experts play Winning Games. It highlights the frames of mind that inform their Games, offers ways we can adopt that kind of thinking, how to say “No!” to zero-sum and destructive Games, and how to invent new Games that will bring out our best and our playfulness. Game Detection Skills. Discover the art of how to detect Frame Games and to operate more mindfully in what we do. Learn how Games recruit us, how to refuse them, how to invite others to play healthier Games, etc. Discover the secrets for managing change. Learn how to run Quality Control processes on our mental and relational Games so that we can catch sick Games before they poison us. Game Analysis. Discover an analysis process for checking out the Games that others seek to recruit us to and which we may unknowingly fall into playing. Games Business Experts Play focuses first on the presence of Frame Games, then on the Frames that set us up to play these Games. It introduces the art of actually catching a Game in action and from there to how to change a Game. The book presents Games for powering up to play, and the Games of the experts. Practical insight about why we (and others) do the things we do in business. Practical ability to Quality Control our games. Develop true empowerment and ability in challenging and changing old toxic Games that undermine success. Take control of the higher levels of mind that determine the Games, their rules, and how to play. Instantly recognize the Games people invite us to play. Develop effectively skills in playing Win/Win Games. Insight about where people, where they are “coming from” (the Games they want to play) and how to effective leverage them to develop greater rapport. Install empowering attitudes for playing. Become clear and focused on the Games that you want to play. Be able to quickly analyze any Game for understanding and reading people.